As of December 1, 2009 in the United States the Federal Trade Commission requires that bloggers and other web authors clearly disclose “their connection, if any, with the advertisers; and also reveal the receipt of free products and or payments from the advertisers“. I believe that this is a good thing, and long overdue. Since the inception of this site in 1999 I have always stated my relationship with companies with which I am involved and the terms under which I review products. But such a statement has never been made in one place at one time. So, with this new impetus, this page has been created to make our position as clear as possible. Products reviewed on this site are generally on loan from the manufacturer and are returned after testing, though more than a few are purchased outright for testing and then sold afterward. If I find a product of personal interest I will purchase it after testing, usually from a retailer but occasionally from the manufacturer. Wherever I buy it I try and get the best discount that I can, but I always make sure that the price is “reasonable“, and not so inexpensive as to be construed as any sort of a bribe. For the record –We have never been offered any sort of compensation (gift or bribe) for any review or article that I’ve written, and would, of course, not have accepted one if it had been. Products on loan, such as cameras and lenses, are returned after the testing period. Software products are not returned because manufacturers don’t want them back. Printers are also not returned, because similarly, manufacturers don’t want them back due to the high shipping costs. We, therefore, keep them for long-term testing and then when they are ready to be replaced with the next and newer version for testing we work with the manufacturer to donate the old model to a local school. Small accessory items (usually those under $250) are usually kept, since sometimes the cost of shipping them back is disproportionate to their value, and manufacturers usually don’t want them returned for this reason. If they interest us we’ll continue to use them; if not we give them away to friends. Products reviewed by contributors are almost always items that they themselves own since few people receive review samples. If the product is on loan to a submitting reviewer we always find out the nature of that person’s relationship with the manufacturer and try and ensure that any claims are reasonable and can be substantiated. We always pay for our own travel and accommodation when going to trade shows. If a visit to a manufacturer is part of a “press junket” with others journalists attending a structured event, we will accept paid airfare, especially when the travel is international. It is usual for companies hosting a visit to entertain, but in our experience, it is always with a budget, and rarely includes excessively expensive restaurants or wine lists. (Those days are long gone). Other than small items, like branded sweatshirts and caps, we have never been offered a gift by a manufacturer and wouldn’t accept one even if it was offered. No cash or any other form of compensation would, of course, ever be accepted. From its inception in 1999 until 2009 this site ran no advertising except for our own products and services, such as videos, books and workshops. 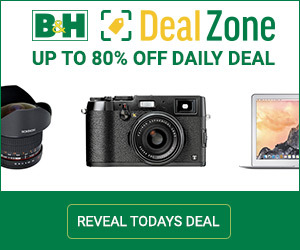 Beginning in 2010 we started running ads from B&H Photo. If someone clicks on a B&H link and subsequently makes a purchase from them we make a small commission. Since B&H sells virtually every photographic product made on this planet we felt that there was no possibility of a conflict. They are brand agnostics. Beginning in early 2011 we are expanding the role that advertising will play. For full disclosure of our new advertising policy please see this notice. In 2017 we have also started to work with Amazon on an affiliate basis. By clicking on a link and purchasing from Amazon you help support this site. We are consultants to a number of companies in the photographic industry; some hardware, some software. We also act as product alpha and beta testers. If we are performing these tasks for remuneration then that is a private business relationship between us and that company and is always under NDA. Therefore, we are not going to tell you who they are. But, we can tell you that if in the end, we want them, we always buy the products that we are involved with consulting on when they do come to market. There are no exceptions to this, other than some smaller accessory items which we simply keep, as mentioned above, because of their low value. Alpha and Beta testers of software products are almost always not paid, but it is customary for the publisher to provide a software key to the final commercial version as a way of saying “Thanks“. These we accept. Small beer, as the British say. In addition to our own workshops and seminars, we teach on behalf of a number of companies from time to time. I have done this for companies such as Canon, Sony, Epson and Phase One, as well as others. When we do so this is work for hire, and it is clear to everyone involved that we are doing this on a commercial basis. Anyone who is familiar with our writing knows that we criticize these company’s products in print as freely as we may praise them, and they seem to like it that way since it reflects the fact that we try and treat all companies and products equally. Paid endorsements usually don’t carry much weight. If you have any questions about any of this, please let me know.